She sat where she had sat countless times before, in the harsh glare of the lights fringing her mirror. Fourteen naked bulbs showed her up in all her rawness – stark like a Noh mask. Fourteen interrogatory lamps burnt into her face, garlanding the looking glass, festooned like wedding arch colonnades – though she had only ever experienced these as scenery on the theatre stage. The lights were tightly focused, barely penetrating the darkness beyond her. Every evening her disembodied head floated in the mirror as she caked it in cosmetics. The glass had flowed, rucked and bubbled, like her own skin. Tarnished where the silvered paint had chipped or turned green with verdigris, it aped her liver spots and burst blood vessels. It occurred to her that she couldn’t ever remember a single bulb having popped: the divine power of the theatre, palace of illusion! There was a time when other bulbs popped: press cameras on preview nights and end-of-run parties. Fluid, promiscuous alignments of leading men and first ladies, arm in arm with supporting cast members all beaming in the lens, then dissolving into their next role at other theatres, other dressing rooms. Yet always this same fourteen bulb guard of honour. She had witnessed her mind’s bulbs pop one by one. It was getting harder to recall her lines. The cards and bouquets had dried up. No wigs or curlers sat on her dresser; they were no longer required. She couldn’t get away with counterfeiting ages, unlike before. All she wanted was to lie down on the ottoman and rest her eyes. 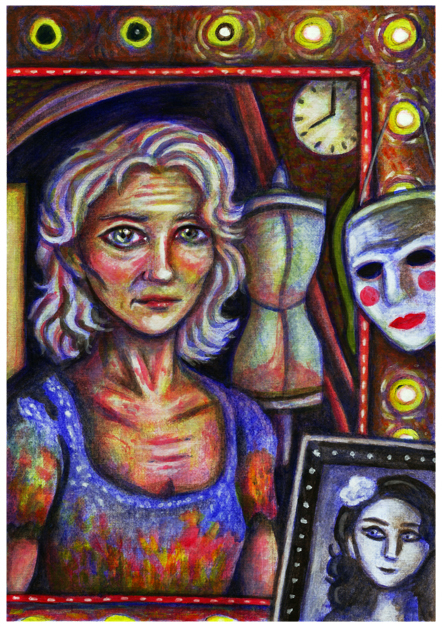 She only appeared in monologues now, of old women looking back on unfulfilled lives. Her hair pulled back by the band, face blanched or greyed out – these were the only effects directors wanted from her; she played women confined to dressing gowns, asylum smocks or wrapped in a bed sheet. She knew it wouldn’t be much longer before she would not recognise the face staring back at her. Her ministrations complete, she flicked the light switch off. The bulbs did not die immediately. She watched the reflected light in her satellite eyes fade gradually in the mirror, until only the outline of her death mask remained square in the flat plane of glass. She sat where she had sat countless times before, with only the green ‘Exit’ light to illuminate her way. Marc Nash has published four novels and three collections of flash fiction on Kindle. His works relentlessly push the form of the novel to its extremes and he places the highest value on language in his work. His live performances are worth catching and he is currently making digital literature works, such as kinetic typography videos as he pursues new ways of making narratives. He lives and works in London. Find him on his author page, YouTube channel, blog, or Twitter.